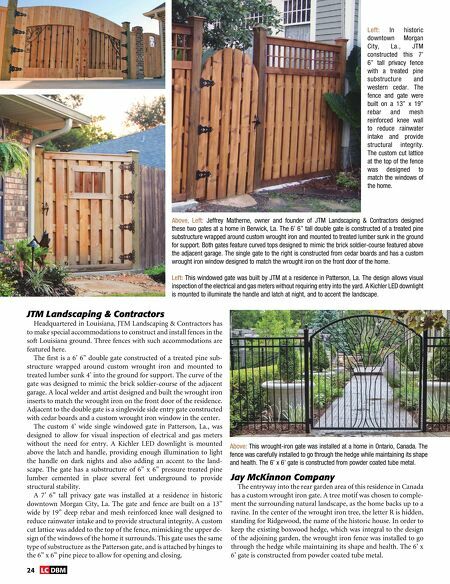 24 LC DBM Above, Left: Jeffrey Matherne, owner and founder of JTM Landscaping & Contractors designed these two gates at a home in Berwick, La. The 6' 6" tall double gate is constructed of a treated pine substructure wrapped around custom wrought iron and mounted to treated lumber sunk in the ground for support. Both gates feature curved tops designed to mimic the brick soldier-course featured above the adjacent garage. The single gate to the right is constructed from cedar boards and has a custom wrought iron window designed to match the wrought iron on the front door of the home. Left: This windowed gate was built by JTM at a residence in Patterson, La. The design allows visual inspection of the electrical and gas meters without requiring entry into the yard. A Kichler LED downlight is mounted to illuminate the handle and latch at night, and to accent the landscape. Left: In historic downtown Morgan City, La., JTM constructed this 7' 6" tall privacy fence with a treated pine substructure and western cedar. The fence and gate were built on a 13" x 19" rebar and mesh reinforced knee wall to reduce rainwater intake and provide structural integrity. The custom cut lattice at the top of the fence was designed to match the windows of the home. Above: This wrought-iron gate was installed at a home in Ontario, Canada. The fence was carefully installed to go through the hedge while maintaining its shape and health. The 6' x 6' gate is constructed from powder coated tube metal. Jay McKinnon Company The entryway into the rear garden area of this residence in Canada has a custom wrought iron gate. A tree motif was chosen to comple- ment the surrounding natural landscape, as the home backs up to a ravine. In the center of the wrought iron tree, the letter R is hidden, standing for Ridgewood, the name of the historic house. In order to keep the existing boxwood hedge, which was integral to the design of the adjoining garden, the wrought iron fence was installed to go through the hedge while maintaining its shape and health. The 6' x 6' gate is constructed from powder coated tube metal. 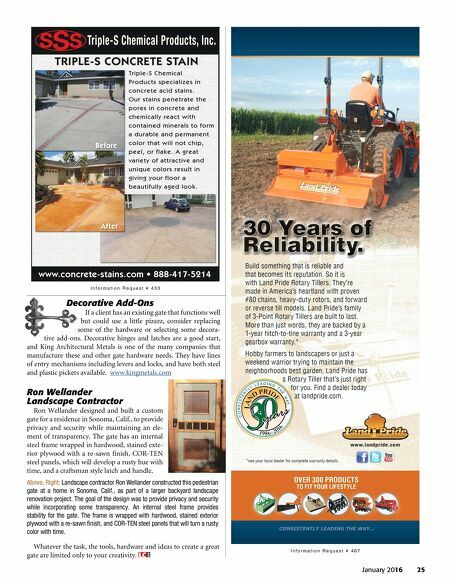 JTM Landscaping & Contractors Headquartered in Louisiana, JTM Landscaping & Contractors has to make special accommodations to construct and install fences in the soft Louisiana ground. Three fences with such accommodations are featured here. The first is a 6' 6" double gate constructed of a treated pine sub- structure wrapped around custom wrought iron and mounted to treated lumber sunk 4' into the ground for support. The curve of the gate was designed to mimic the brick soldier-course of the adjacent garage. A local welder and artist designed and built the wrought iron inserts to match the wrought iron on the front door of the residence. Adjacent to the double gate is a singlewide side entry gate constructed with cedar boards and a custom wrought iron window in the center. The custom 4' wide single windowed gate in Patterson, La., was designed to allow for visual inspection of electrical and gas meters without the need for entry. A Kichler LED downlight is mounted above the latch and handle, providing enough illumination to light the handle on dark nights and also adding an accent to the land - scape. The gate has a substructure of 6" x 6" pressure treated pine lumber cemented in place several feet underground to provide structural stability. A 7' 6" tall privacy gate was installed at a residence in historic downtown Morgan City, La. The gate and fence are built on a 13" wide by 19" deep rebar and mesh reinforced knee wall designed to reduce rainwater intake and to provide structural integrity. A custom cut lattice was added to the top of the fence, mimicking the upper de- sign of the windows of the home it surrounds. This gate uses the same type of substructure as the Patterson gate, and is attached by hinges to the 6" x 6" pine piece to allow for opening and closing.